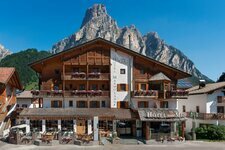 The Alta Badia is surrounded by four Dolomite passes which invite to an unforgettable Dolomites Tour. A true classic among bikers! The Alta Badia is embedded in a fabulous mountain landscape, offering interesting streets for motorcyclists as well as some alpine passes. Particularly popular is the Big Dolomites Tour on motorbike, a 250 km long full day trip including the 2,218 m high Passo Sella, the Passo Pordoi (2,239 m asl) and the 2,105 m high Passo di Falzarego mountain passes. Another well-known route is the one to the Passo delle Erbe (see picture), known as Ju de Börz in Ladin language. The 1,981 m high mountain pass, located beneath the mighty Sass de Putia Group, is accessible via San Martino in Badia and leads to Bressanone and the Valle Isarco valley. Of course also a tour round the majestic Sella alpenstock is an absolute must-do - it is a trip including four Dolomite passes (the above mentioned as well as the Passo Gardena mountain pass). The streets with their many bends and the overwhelming panorama are an unforgettable adventure! Please note that the passes could be closed to motorised traffic on some days, e.g. for the famous Sellaronda Bike Day, and that there are increasingly speed controls on the pass roads.